known for his unique accumbularation... but all he really does is race minivans. Very very fast. Some say... 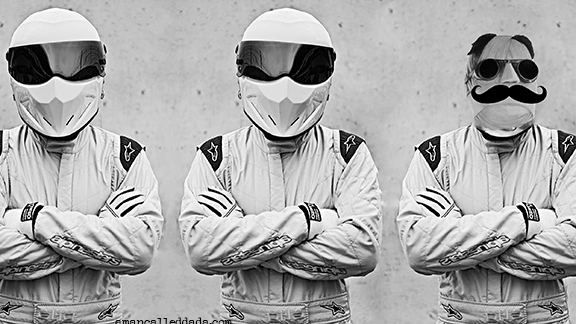 The STIG-DA-DA was only created to test minivans... and that his hands are sewn into a Nomex straightjacket. Some say... he once ate a windmill made entirely of cheese... and that a river will NOT run through him. Some say... The STIG-DA-DA once ingested a lump of coal and pooped out a diamond... and that Julie Andrews sings about him constantly. Some say... he was invented by BEES... and his spare testicle runs St. Petersburg. Some say... The STIG-DA-DA's underpants won the war -- any war -- and his shinbones are hewn from blocks of pure aluminium. Some say... his tear ducts are the main source of all horseradish... and that he can only understand the Language of Love. Some say... The STIG-DA-DA's mons pubis orbits the planet Jupiter... and his pheremones once ruined the CERN supercollider. Some say... his notions of antedeluvian art are unprintable... and he's considered a genius of snake husbandry. Some say... The STIG-DA-DA twice pedaled a Panamanian freighter through the streets of Mogadishu... and that his oeuvre is unpronounceable by Jeremy Clarkson's pet monitor lizard. Some say... he has no grasp of Euclidean Anamorphism... and that his tacos require no shell. Some say... The STIG-DA-DA can make small children do his bidding... but only because they share the same brain. Some say... that he begins and ends in ellipsis... and automatic doors open for him when he's not even there. Some say... The STIG-DA-DA can be conceptualized only in sets of 13... and that he ironically suffers from Triskaidekaphobia. ...all we know is, he's called The STIG-DA-DA. Some say... The STIG-DA-DA once drove a "CHRISTINE" movie stunt car so fast she spontaneously burst into flames.